When trading in stocks you’ll encounter the emotions of Fear and Greed. While Fear can keep you from taking risks to maximize your profits, Greed pushes you to make decisions that will end in huge losses and deprive you of any further opportunities to make money. One must remember that Greed and Fear arise from Inexperience and Lack of Knowledge. 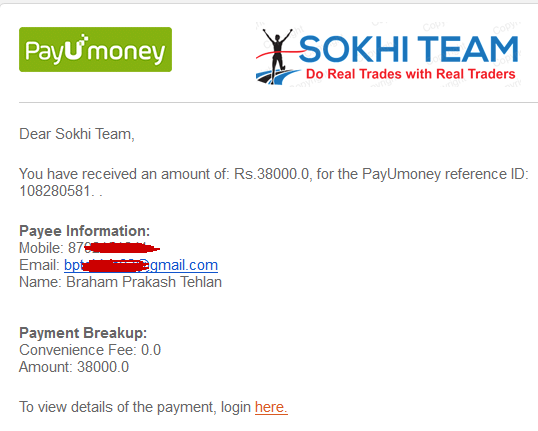 This is exactly what Mr. Braham Prakash Tehlan who joined us 3 months back experienced and learned trading with SOKHI TEAM of Real Traders. Yesterday he went for a Life Time Association with SOKHI TEAM of Real Traders.